Though organized crime continued rampant in Denver, a new state governor had been elected. Running on a platform of social reform, Davis H. “Bloody Bridles” Waite took office in January 1893 and immediately began to look into corruption in Colorado. By the following year, in March, he was ready to take on Denver’s politically corrupt machine. He began by firing three members of the fire and police board who he felt were the main instigators of corruption within city hall. He further demanded that the city immediately begin to clean itself up or he would do it for them. Replacing the corrupt men with his own appointees, when the new men arrived, the current commissioners refused to leave. Interestingly, the state charter allowed the governor to make appointments but did not grant him the power to force a municipal government to accept the appointments. The other corrupt city officials, fearing for their own positions, backed their bosses, and collectively refused to abandon their power. The city also took the matter to the district court, who issued a temporary injunction forbidding the governor from interfering with the city’s appointees. However, Governor Waite and his attorneys insisted that the State’s chief executive was not subject to a review by a district court. Continuing to demand that the commissioners step down, Waite threatened to call out the state militia to force them out if need be. 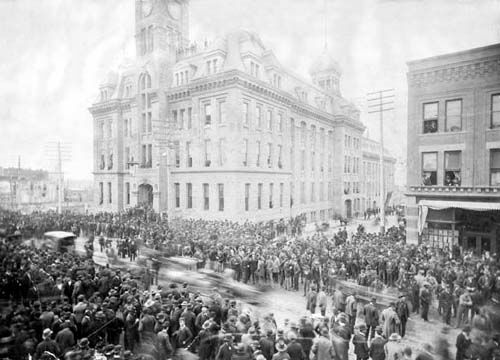 As armed characters guarded city hall, Governor Waite ordered Colorado State Militia to forcibly remove the commissioners. By mid-March, the governor had declared martial law and Denver was an armed camp. 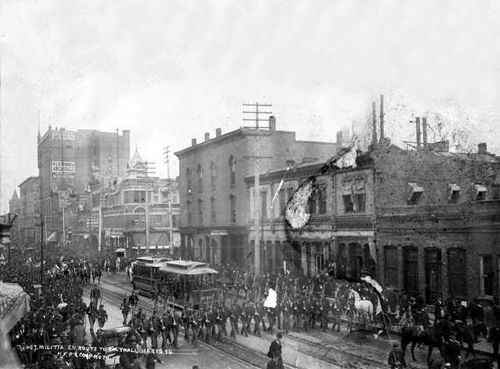 Waite’s military force of about 200 men marched downtown, along with two Gatling guns and two twelve-pound canons. Pointing their large weapons directly at city hall, they faced the “special police force,” who were assembled with rifles and shotguns. With “Colonel Smith” at the helm, the “police force” dared the militia to fire on them, threatening to use dynamite if they attacked. The two sides faced off in a standstill as thousands of civilians looked on. In the meantime, the Chamber of Commerce and other committees of citizens were working feverishly at a compromise that would prevent the opening of hostilities. Finally, it was agreed that the issue would be left up to the State Supreme Court. 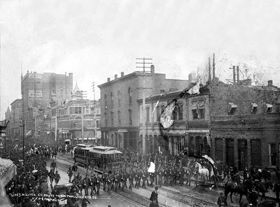 Waite withdrew his military forces to await the decision as the city of Denver breathed a sigh of relief. 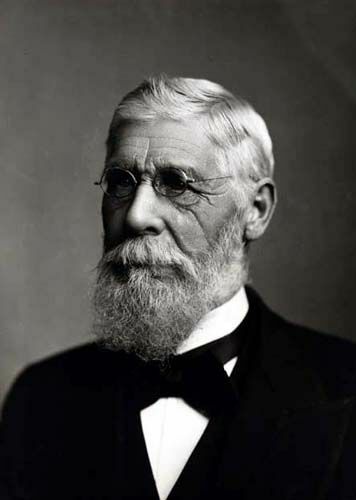 On April 16, 1894, the Supreme Court made its decision, a conclusive victory for Governor Davis Waite and the board of commissioners was replaced the next day. The political machine was smashed and new policies began to be developed almost immediately to clean up the town. Soon, gambling was made illegal in Denver and the new authorities cracked down hard on other illicit activities, such as prostitution, bootlegging, and the many and varied bunko activities. 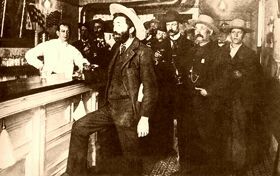 One of their first priorities was to run Soapy Smith out of town. But Smith simply took his operations “underground. However, he and his brother, Bascomb, were soon charged with the attempted murder of a saloon manager. Bascomb was arrested and jailed, but Soapy managed to escape and, a wanted man in Colorado, he soon wandered westward. The Blonger Brothers then took control of the Denver underworld. When the Klondike Gold Rush began in 1897, Soapy saw all sorts of new opportunity and soon made his new home in Skagway, Alaska. Like other mining camps, it didn’t take him long to claim himself as “boss” of the town, which he ran with an iron hand. Working from his saloon named Jeff Smith’s Parlor, Soapy’s cons began once again in earnest. 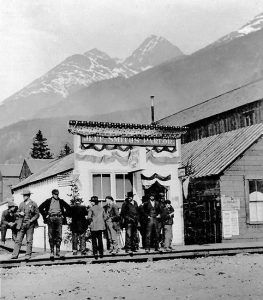 His saloon soon became known as the “real city hall,” even though Skagway already had an official one. But, some of the Skagway citizens were not so impressed with Soapy, whose heavy drinking and black temper had begun to get completely out of hand. Soon, a number of Skagway citizens had had enough of the man and a vigilante group, who called themselves the “Committee of 101,” threatened to drive Smith and his gang out of town. However, Soapy retaliated by forming his own group that he said had more than 300 members. Hoping to force the vigilantes into submission, it worked. When the Spanish American War began in 1898, Smith formed his own voluntary militia with the approval of the U.S. War Department. Called the Skagway Military Company, Soapy became its captain, strengthening his control of the town. In the meantime, the vigilante group did not like what they were seeing and when Soapy’s gang took some $2,600 in gold from a Klondike miner in an illegal Three-card Monte game, the vigilantes re-emerged and demanded that Soapy give him back his gold. Soapy, of course, refused, claiming that the miner had lost the gold “fairly” in a sporting game. 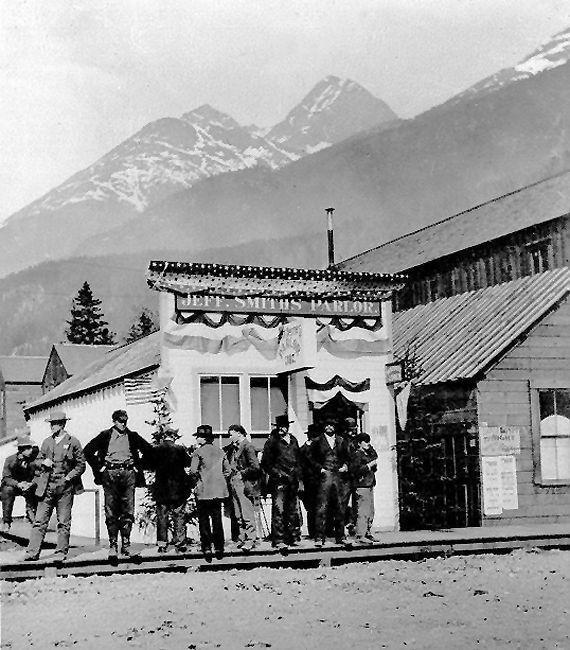 The next night, on July 8, 1898, the vigilantes organized a meeting in Skagway, Alaska. Hearing of the meeting, Soapy decided to attend himself, arriving with a Winchester rifle draped over his shoulder. When he was barred from entering the meeting, he argued with one of four guards, a man named Frank Reid, who was blocking his way. Before long a gunfight erupted and when the smoke cleared both men lay dead. Soapy’s last words were reportedly: “My God, don’t shoot!” Later, it was found that it was actually another one of the guards who had actually shot Smith. Three other members of Soapy’s gang who were involved in “robbing” the miner received jail sentences. The rest of the gang soon drifted apart. 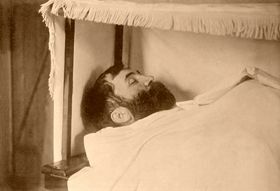 Soapy Smith was buried just outside the city cemetery. His grave and his saloon, which has since been moved from its original location, can still be seen in Skagway.